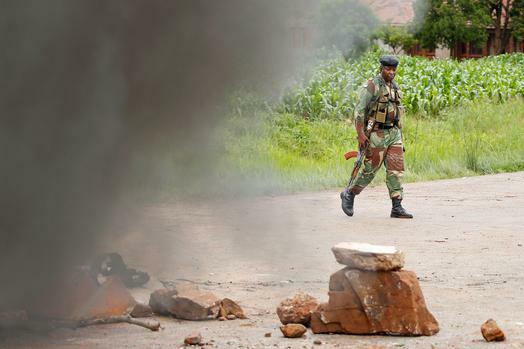 Bulawayo,- Zimbabwe police fired tear gas to disperse protesters in the second city of Bulawayo on Tuesday, a day after the country was rocked by violent demonstrations against a sharp hike in fuel prices. Police moved in after protesters chanted for the removal of President Emmerson Mnangagwa and as looting broke out in Bulawayo, a stronghold of opposition to the ruling Zanu-PF party, an AFP reporter witnessed. The streets of the capital, Harare, were deserted after Monday's demonstrations when public anger over Zimbabwe's worsening economic crisis erupted. The government more than doubled petrol prices at the weekend after months of shortages when drivers have been forced to queue for hours to fill up, while essentials such as bread and medicines have also been scarce. In the capital Harare, most shops remained closed after Monday's protests and minibus taxis that usually transport workers from the suburbs to the city centre were not running. In Kuwadzana suburb, police were on patrol and forcing people off the streets. One resident, Tawanda Mataya, said he and his 17-year-old son had been beaten up by police. "It's so painful," Mataya told AFP showing swellings on his back. "I was standing at my gate to assess whether I could go to work then this group of police who were passing by started beating me. "My son who heard me screaming and opened the window to see what was happening was slapped several times." In a televised address late Saturday, President Emmerson Mnangagwa announced the fuel price hike, saying it was needed to tackle severe shortages and "rampant" illegal trading. Mnangagwa took over from long-time ruler and autocrat Robert Mugabe following a military takeover in 2017, before winning a disputed election in July. Currently on a tour of European countries, Mnangagwa will attend the World Economic Forum at Davos, Switzerland, next week. Speaking in Russia on Monday, Mnangagwa said the fuel price increase "was necessary and still is". On Monday, the police had dispersed hundreds of protesters who burnt tyres, erected barricades and looted businesses on the first day of a three-day general strike. Security Minister Owen Ncube said the security action caused "loss of life" without giving figures on the number of dead and wounded. The Zimbabwe Association of Doctors for Human Rights said 13 people had sustained gunshot wounds in and around Harare on Monday. At least 200 people were arrested during the disturbances. Zimbabwe's mobile phone networks and internet were partially shut down, with one industry source saying the systems had been jammed and many users complaining of limited access. On Tuesday morning the Twitter account of the Ministry of Information said that "public order has been restored". The Zimbabwe Trade Union Confederation (ZCTU), for its part, reiterated its call to strike. "Today it's day two of the Shutdown. We urge workers and citizens everywhere to stay at home," ZCTU tweeted. "Our struggle is genuine and there must be economic reforms for the poor to survive." Zimbabwe's economy has been in dire straits since hyperinflation wiped out savings between 2007 and 2009, when the Zimbabwean dollar was abandoned in favour the US dollar. Zimbabweans rely on electronic payments as US dollar notes are in short supply. The local "bond note" currency, introduced in 2016, is little trusted and falling in value. Mnangagwa -- Mugabe's former deputy -- has claimed that he represented a fresh start for the country and vowed to revive the economy by attracting foreign investment. In Bulawayo, one night guard on duty outside a closed shop told AFP that his colleagues had not turned up to work on Tuesday. "Things are hard, and the protest and the protests should continue as long as they are peaceful," said Nicholas Banda.